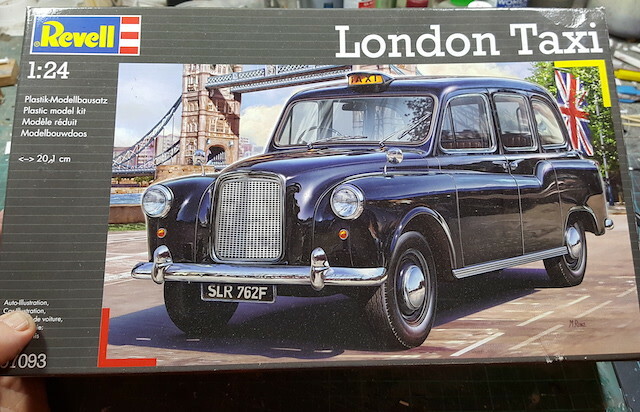 For my Racing GB "big job" I shall be taking a Revell London Taxi (which looks suspiciously like a reboxed Japanese kit) and building a dragster with it. I know what a ZF gearbox looks like, in fact I've got one (RW), but not a transaxle BTW. I'm going to have to buy one of these now. Actually it does look remarkably like my ZF gearbox, I wonder if they have a 'house style' to the ribbing etc. 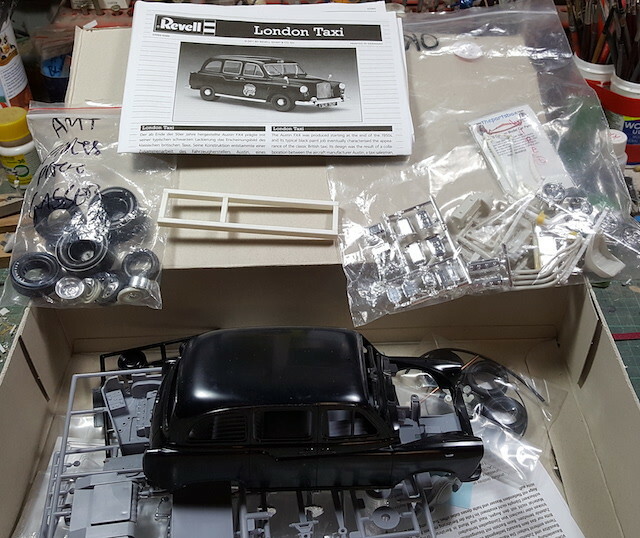 I have begun this build by carrying out the traditional task which (in my mind anyway) marks a car kit as started - I have glued the engine halves together. The engine in this case is a 392 Hemi taken from an AMT '53 Studebaker. Yep. Cubic inches and forced induction. Are you going to chop the roof to lower it? I have the same Revell kit, I started a Rat-Rod by deleting the rear passenger compartment and moving the front windscreen back to create a longer engine bay. I filled in the front door sills. Thin tyres at the front and wide tyres at the back. I think I can drop the body but I lost my mojo on this build. No. It's going to have a completely stock roof. I want it to look, at first glance, like an ordinary taxi. I may move the rear wheel arches forwards A/FX style. Today the engine gained it's sump, heads and valley cover. A change in chassis choice. 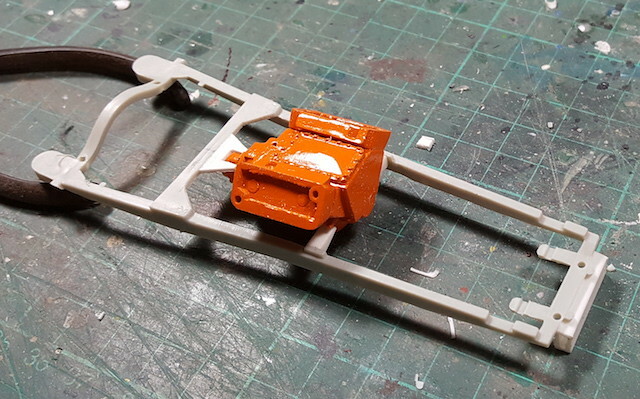 I had a rummage in my Hot Rod parts box and found a chassis I think is from an AMT Ala Kart. It's probably vaguely based on a late twenties Ford model T chassis. Perfect. I've chopped it about a bit and built some engine mounts. As you can see i've got a fair bit of engine setback. A fair bit? It's almost rear engined! Fifties/Sixties dragster technology. Having more weight towards the rear gave extra traction on launch. The tyres of the day needed all the help they could get. The engine on my drag racing Imp was so far to the rear that it was almost outside the car. And the Mini drivers wondered why we ALWAYS out-dragged them at the start!